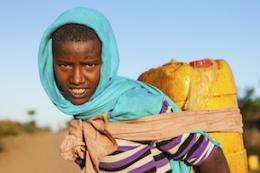 Ethopian girl carries water to her village . The vast region of Africa known as the Sahel will descend into large-scale drought, famine, war and terrorist control if immediate, coordinated steps are not taken to avert the perfect storm of climate change and the most rapidly growing population in the world, a group of experts from the University of California, Berkeley, and the African Institute for Development Policy (AFIDEP), concluded in a report released today, which summarizes findings from the first international, multidisciplinary meeting on the region. "The collision of population growth and climate change will lead to the misery of tens of millions of people and reach well beyond the region," said Malcolm Potts, a professor of public health and lead author of the report. There's been extraordinarily little investment in the region, said Potts, an obstetrician and family planning expert who was among the first researchers to identify and address the AIDS crisis in Africa. "AIDS killed 30 million people, but the disaster in the Sahel will be larger than that." The Sahel is a three million square mile band of arid and semi-arid land stretching from the Atlantic Ocean to the Red Sea and bordering on the Sahara desert. The United Nations projects that the population will leap from 100 million today to 340 million in 2050; there were just 30 million people in the Sahel in 1950. More frequent droughts caused by climate change will lead to significant starvation rates and fighting over diminishing resources. Unstable conditions are already breeding grounds for terrorism; increased instability will lead to a series of failed states, safe haven for terrorist activity, and, very likely, prolonged war. The report, called "Crisis in the Sahel: Possible Solutions and the Consequences of Inaction," spells out key linkages between seemingly different problems. For example, due to climate change, drought is becoming more frequent and more severe, exacerbating the existing hunger problem. "Today's extreme weather events will become the norm in 20 years," said Michael Wehner, a climate scientist at the Lawrence Livermore National Laboratory, and a report co-author. But rapid population growth undermines existing humanitarian efforts, increasing the starvation rates further. In addition, terrorism and political chaos make getting food to hungry people more difficult. "Just the logistics of getting food around to these places gets more and more dangerous as social stability deteriorates," said demographer Eliya Zulu, the founder and executive director of AFIDEP, and also a report co-author. Empowering women in the region is another key issue in the report. "These women are grandmothers by the time they're 30," Zulu said. In Niger, for example, a quarter of all women over 40 have 10 or more children. The report cites a successful—and scalable, researchers say—pilot mentoring program in Nigeria, designed to delay child marriage. Invest in the well-being of girls and young women—e.g., by providing girls with access to schools and mentoring, and by opposing female genital mutilation, which creates lifelong suffering for many victims. Invest in family planning—promote policy changes to overcome misinformation and barriers to access currently preventing women from making choices about their family size. Promote actions that prepare people for the impacts of climate change—e.g. help communities to develop small-scale energy and water systems, and to implement agricultural measures such as adjusting soil inputs and water storage systems for changing conditions. The window of opportunity to act is closing, researchers say. In Mali, for example, increasing terrorist activities have been widely reported in American media, including the recent attack on an Algerian oil field, and fundamentalist cruelties in Timbuktu. Immediate action is also critical because it takes time to slow population growth, get girls into school, and train people to change the agricultural methods their families have practiced for generations. Fighting the root causes of instability will cost much less than inaction, Potts said. "Between feeding the hungry, fighting pirates at sea, chasing terrorists and coping with the refugee effect, instability in the region is already costing the international community many billion of dollars per year," he said. Last year 18 million people went hungry across the Sahel, according to UNICEF. "It's going to get much worse," Potts said. "One of the roles of the university is looking 10-20 years ahead. We've got to do that. Or instead of having 12 or 18 million hungry people, we will have 30 million hungry people, and a domino effect that has worldwide impact." The report is the first publication of the OASIS Initiative (Opportunities to Advance Solutions in the Sahel), a collaboration of UC Berkeley's College of Natural Resources, the Bixby Center for Population, Health and Sustainability, and a growing number of African partners. The project's key goals are to advance solutions and bring them to scale across the region, and to develop the scientific evidence base that underpins policy change, social and agricultural programs, and funding. So they just need family planning, education, empowerment of women and a reduction of religious extremism/intolerence. The problems for this region are so complex and so numerous! Good luck to this group in trying to implement such deep and broad change is such unstable countries. "the perfect storm of climate change"
Seems to me climate change is the least of their worries. I'm not surprised climate change was mentioned first thing. The enviro Do-Rights never miss an opportunity to further the AGW agenda. And so the AGW drubbing continues...AGW is/will be attached to every human malady from now on. There is no low that the AGW Alarmist cult won't go. Exploit another human tragedy to propagate their agenda. Ah well, when you have exhausted all your lies, what is one to do.